The parsha of Noach brings to a close the eleven chapters that precede the call to Abraham and the beginning of the special relationship between him and his descendants, and God. 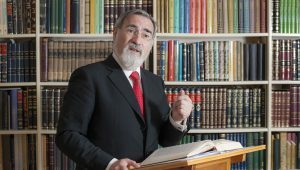 During these eleven chapters, the Torah gives prominence to four stories: Adam and Eve, Cain and Abel, Noah and the generation of the Flood, and the Tower of Babel. Each of these stories involves an interaction between God and humanity. Each represents another step in the maturation of humanity. If we trace the course of these stories, we can discover a connection that goes deeper than chronology, a developmental line in the narrative of the evolution of humanity. Faced with primal failure, the man blames the woman, the woman blames the serpent. Both deny personal responsibility: it wasn’t me; it wasn’t my fault. This is the birth of what today is called the victim culture. The Lord said, “What have you done? Listen! Your brother’s blood cries out to Me from the ground (49:9-10). The third is the story of Noah. Noah is introduced with great expectations: “He will comfort us” (5:29), says his father Lamech, giving him his name. This is the one to redeem man’s failure, to offer comfort for “the earth which God cursed.” Yet though Noah is a righteous man, he is not a hero. Noah does not save humanity. He saves only himself, his family and the animals he takes with him in the ark. The Zohar contrasts him unfavourably with Moses: Moses prayed for his generation, Noah did not. In the end, his failure to take responsibility for others diminishes him as well: in the last scene we see him drunk and exposed in his tent. In the words of the Midrash, “he profaned himself and became profaned.” One cannot be a sole survivor and still survive. Sauve-qui- peut (“let everyone who can, save himself”) is not a principle of Judaism. We have to do what we can to save others, not just ourselves. Noah failed the test of collective responsibility. The fourth is the enigmatic story of the Tower of Babel. The sin of its builders is unclear, but is indicated by two key words in the text. 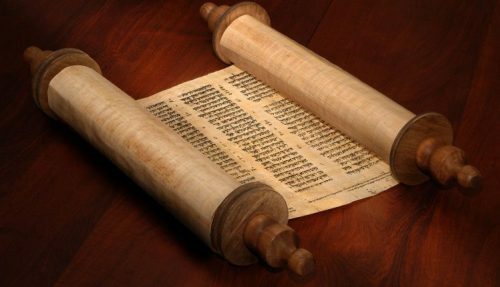 The story is framed, beginning and end, with the phrase kol ha’aretz, “the whole earth” (11:1, 8). In between, there is a series of similar sounding words: sham (there), shem (name), and shamayim (heaven). The story of Babel is a drama about the two key words of the first sentence of the Torah: “In the beginning God created heaven (shamayim) and earth (aretz)” (1:1). Heaven is the domain of God; earth is the domain of man. By attempting to build a tower that would “reach heaven,” the builders of Babel were men trying to be like gods. This story seems to have little to do with responsibility, and to be focusing on a different issue than do the first three. 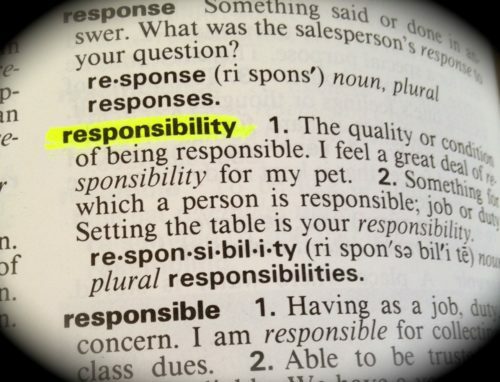 However, not accidentally does the word responsibility suggest response-ability. The Hebrew equivalent, ah?rayut, comes from the word ah?er, meaning “an other.” Responsibility is always a response to something or someone. In Judaism, it means response to the command of God. By attempting to reach heaven, the builders of Babel were in effect saying: we are going to take the place of God. We are not going to respond to His law or respect His boundaries, not going to accept His Otherness. We are going to create an environment where we rule, not Him, where the Other is replaced by Self. Babel is the failure of ontological responsibility – the idea that something beyond us makes a call on us. What we see in Genesis 1–11 is an exceptionally tightly constructed four-act drama on the theme of responsibility and moral development, presenting the maturation of humanity, as echoing the maturation of the individual. The first thing we learn as children is that our acts are under our control (personal responsibility). The next is that not everything we can do, we may do (moral responsibility). The next stage is the realisation that we have a duty not just to ourselves but to those on whom we have an influence (collective responsibility). Ultimately we learn that morality is not a mere human convention, but is written into the structure of existence. There is an Author of being, therefore there is an Authority beyond mankind to whom, when acting morally, we respond (ontological responsibility). For more on Cain and Abel, see the essay “Violence in the Name of God”, Covenant and Conversation: Genesis, p29.